Organizations clearly cannot reach their state of Digital nirvana without professional help. "Digital" capabilities, in this context, relate to the acumen of operational services talent to understand the interplay between their applications and processes to achieve better automation and more productive workflows that can ultimately lead to better analytics to base future business decisions. In addition, these capabilities also relate to the creative flair of staff to align their services with the core business and come up with new ways of doing things to drive value, new ideas for business improvement and, in short, to behave more like a "front office" employee than transactional operator. Bad IT can be even more culpable than bad BPO. Let's not throw all the blame for this talent failure at the doorstep of the business operations staff. In so many cases, enterprises would have much more effective process capability if corporate IT wasn't so constipated with maintenance and infrastructure. In so many client cases, IT still can't figure out how to code without error, and they've done it for decades... at least processes change, but IT continues to be stuck in the dark ages for so many organizations. At HfS, we predict a major talent crunch coming to the vast majority of ambitious organizations who are struggling to find or retrain their back office staff to be more front office staff and "Digitally savvy" with their approach to services. Two thirds of outsourcing clients are happy with how their internal teams manage costs, keep the basics ticking over ("lights on") and respond to compliance needs. But, as these "light on" capabilities become increasingly commoditized through more sophisticated global delivery and standardized technology platforms, the need for these armies of back office operators is steadily decreasing. What is clear is that technology has become a major component for future value of the enterprise (read our earlier study on this topic) and one avenue for operations staff to increase their future value is to train in areas like analytics and process automation where they can add whole new echelons of value to their organizations. Sadly, many of the two-thirds we identify above are not going to make it, and others are simply not going to be needed - the relentless pursuit of increased value and decreased labor costs will see to that. Less is more is the brutal rule for the future of the enterprise operations function. For forward looking service providers and consultants, these clients are becoming rich hunting grounds for valuable partnerships in the future as the need for the Digital skills and new talent exacerbates. Most clients will find their need to develop or acquire better talent a fruitless exercise and will look to their external partners to plug these operational gaps that will drive future value. "If corporate IT wasn’t so constipated with maintenance and infrastructure"
This will not change as long as the climate is not open for ideas - "this is how we do it", "sit down and do what you are told" needs to change rapidly within the organisations themselves. It has few to do with "talent", more with the appreciation of brain usage and critical thinking. It is sad that the lowest area is to innovate which our study last year on the workforce worldwide showed is exactly what the workforce wants to be doing to be more engaged in their roles and productive in their companies. But Carol and Paul are right: companies have to want to come up with new ideas and ways of working -- to actually change -- and change management capabilities were rated by workers as one of the biggest challenges in their organizations. 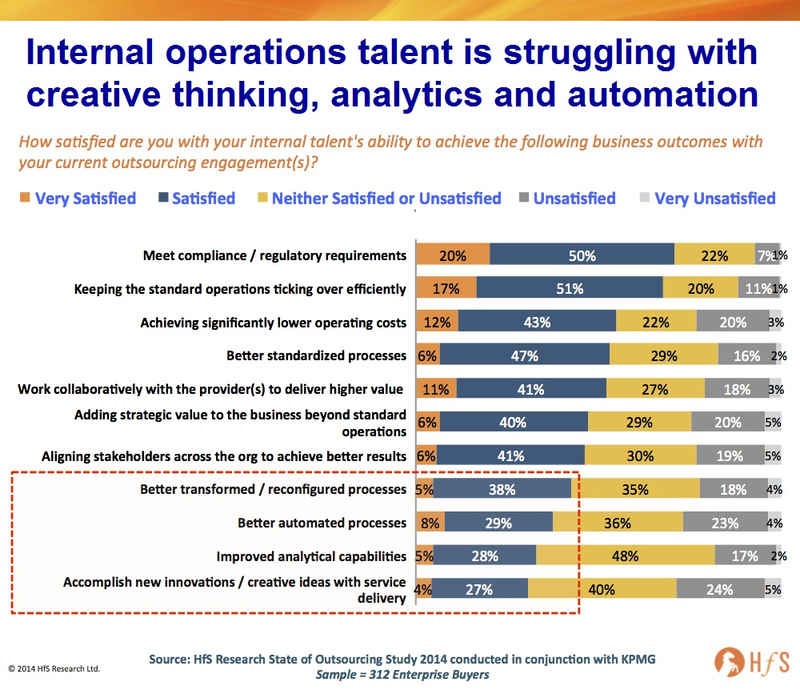 Operational readiness and organizational effectiveness has to replace the hire to retire process-centric approach of too many HR organizations, and ironically it is going to require investments in people and workforce enablement-support infrastructure -- not simply more new technology -- to resolve. Very interesting Phil. At Genfour, we are constantly experiencing a lack of capability in organisations to truly understand their processes, think through how to systemise them and then get the right engagement from IT to work through an automation programme. It is only by developing these capabilities that the full digital agenda can be embraced.... and only then can the true innovation cycle begin, the one that will keep them in business in the future. Dearth of talent is so challenging that critical digitization programs are stuck. Aeging skills are not needed anymore, new/emerging skills are largely misunderstood. One example is big data: this is a new terrain with new technology and even new ways of reimagining business process. So you can imagine how hard it gets when you are looking at the current people/process/tech state. How is one to transform this to a always on, digitally savvy, semantically adaptive organizational state. Good piece and I echo some of the earlier comments. For many companies there are "cultural shields" that prevent or devalue transformational initiatives, while for others it is the internal crud of bureaucracy that inhibits. On my last project it took nearly six months to install a simple server for some automated processes. When I expressed my frustration I was told by the CIO that I shouldn't feel singled out as they do it to themselves all the time. In my experience in shared services and outsourcing I constantly see "Service Delivery Management" struggling to balance the need for the top elements in your chart (costs, efficiency, compliance, standardisation) with those you have marked out in the red-box (innovation, creativity, “better…”). They are pretty good at costs etc, but this seems to constrain the ability to address innovation and the need to ‘to behave more like a “front office” employee than transactional operator.’ Without more balance we will continue to see deal constructs around costs and transactions, and service delivery teams managed to deliver just that at the expend of “better”. Isn&#8217;t it time individuals stopped pretending they&#8217;re companies?